Milk tea is here to stay. Franchising has undoubtedly been a popular and profitable way to make the shift from employee to entrepreneur. There are approximately 125,000 franchised outlets in the country as of May 2012. But what determines franchise success? The support of the franchisor is crucial to the success of a brand on top of good old-fashioned hardwork by the franchisee. Keeping communication lines open between the franchisor and franchisee is also crucial. If you are thinking of getting a franchised business, be on the lookout for industry events where you can see and compare many brands all under one roof. One of the major industry events of the year is the Franchise Asia Philippines 2012 where we saw established and new franchise brands come into the market. Milk tea\\\'s popularity is here to stay. 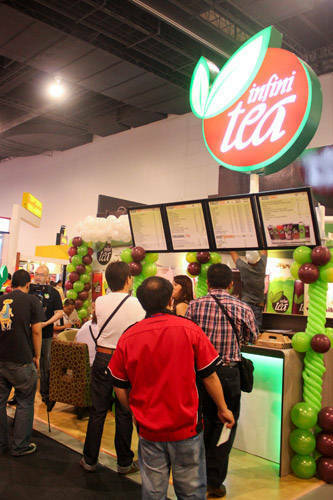 One of the new brands to enter this market is Infinitea. Their drinks are guaranteed made from freshly brewed loose-leaf tea. In addition to milk tea they also have coffee and frappuccino. So far, Infinitea has 13 branches all over the metro mainly concentrated in university areas like UST campus, UERM and Katipunan. Are you interested in an Infinitea franchise? For more details, click here.